people and adults from our community to graffiti — with words of inspiration and great ideas — a bus parked in ther city’s center. We wanted to showcase the creativity and ideas of our young people. Check out our project! To launch a promotional campaign for the event, we decided to paint a bus in the city center! Why bus graffiti? Because the motto of this year’s event is “You Think, Therefore You Create,” and we wanted to showcase the creativity of our youth. And we did — we invited local young people to participate in this project, and encouraged them to not be afraid of thinking and doing. Everyone (even adults!) lent a hand, and had the chance to make art on our bus. While everyone worked, four young musicians from one played live music. 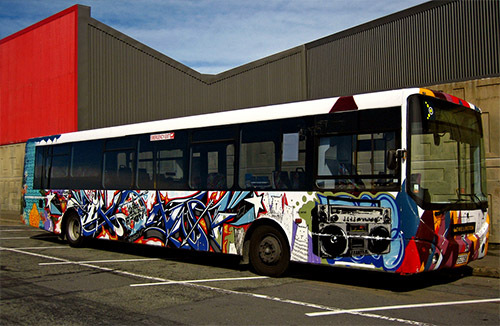 The resulting “Graffiti Bus” was an amazing piece of art. In Aveiro, we believe in the power of our young people. We believe that they will think constructively, think in innovative ways, and think forward. We believe that from this way of thinking, beautiful products will be created. or the next five weeks, the TEDxYouth@Aveiro bus will travel around our city, inviting our community to embrace the TEDxYouth@Aveiro event, to believe in our youth, and to be at “Teatro Aveirense” on November 20.